A tree surgeon who was filmed swallowing a goldfish at a funfair and washing it down with half a pint of lager avoided jail today. 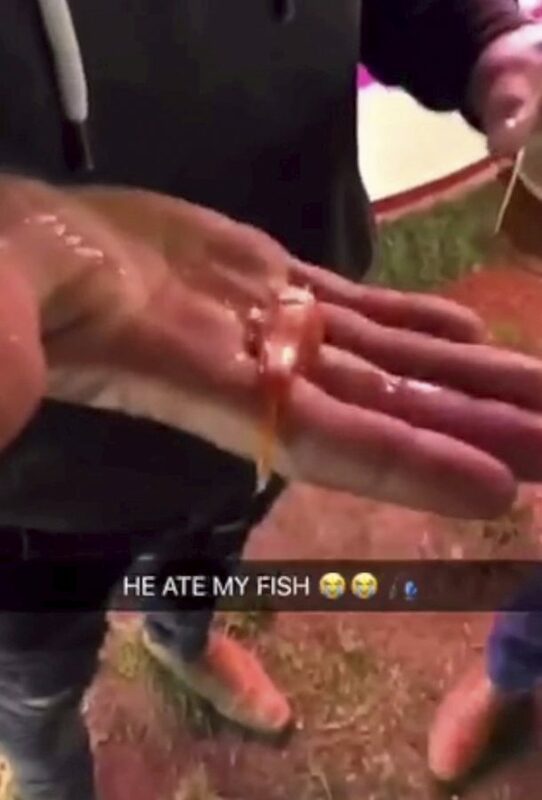 Josh Coles, 27, was caught when his girlfriend filmed the incident and posted it on Snapchat with the caption: “He ate my fish”. 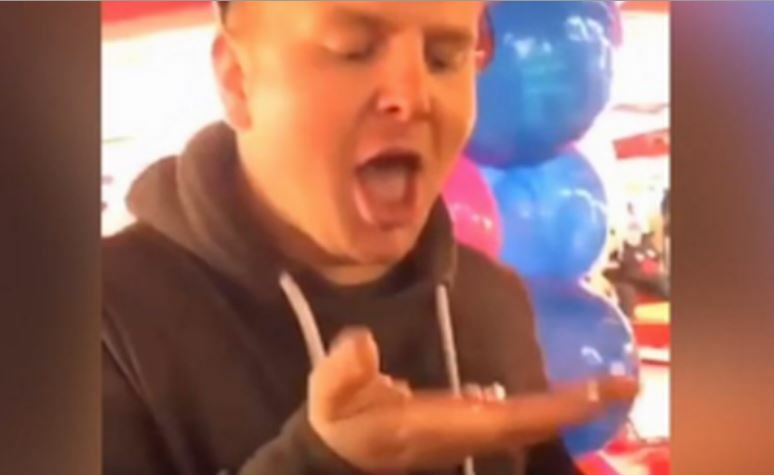 In the 14 second clip, he can be seen holding the live fish in his flattened palm before throwing it in his mouth, taking a gulp of lager and swallowing it down. He then proudly opens his mouth and pokes his tongue out to prove he has downed it. The video was widely shared and reported to the RSPCA by those concerned about what they had seen. Magistrates heard how the fish would have been under stress and would be caused unnecessary suffering as it went slowly through his digestive tract before death. Coles, of Tiverton, Devon, initially denied a charge of causing unnecessary suffering to a protected animal in September last year but changed his plea to guilty to avoid a trial. Wearing a tweed jacket, dark skinny jeans and a check shirt, he left Exeter Magistrates Court crouched down in the back of car to avoid being photographed. 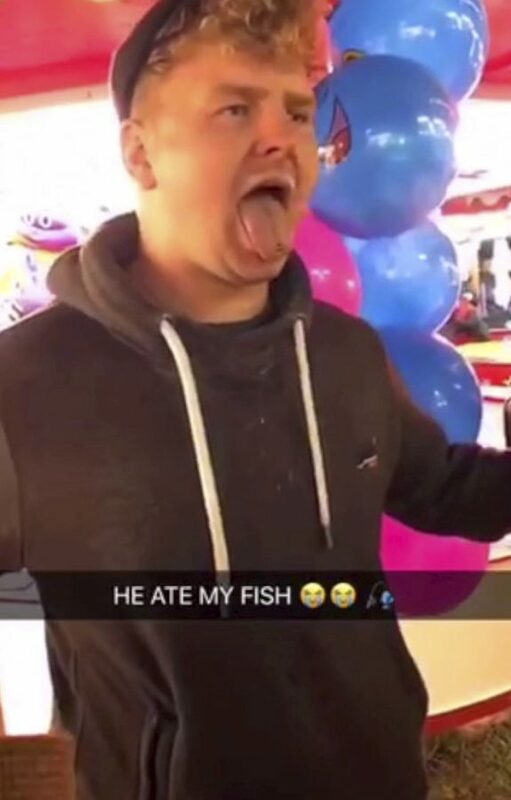 The court had earlier been shown the video of Coles placing the small goldfish in his mouth and washing it down with a half a pint in a plastic cup at Bridgwater Carnival between September 26 and 29 last year. He received a 12-month community order and was banned from keeping fish for five years. He was ordered to undertake 200 hours of unpaid work and up to five rehabilitation activity days to consider decision-making and alcohol consumption. He must pay an £85 victim surcharge and £300 court costs. Lindi Meyer, prosecuting, asked magistrates to consider a custodial sentence, referencing the case of Daniel Challis, 24, who swallowed a pet fish as part of the ‘Neknominate’ drinking challenge. He received an 18-week prison sentence suspended for one year in 2017. Ms Meyer told the court the fish would have suffered injuries to its scales when it was handled. She added that the “acidic environment” of his stomach would cause further pain and the fish would be “deprived of oxygen”. “There was never going to be any other outcome but death from his actions,” Ms Meyer told the court. “These cases are not unusual and courts have taken them very seriously. “It was videoed and posted on social media by his girlfriend. “He said it was initially a stunt for social media and the goldfish was ok and he hadn’t swallowed it. “He seemed bemused by the investigation and asked what would happen as it is only a goldfish. Jeremy Tricks, mitigating, asked magistrates to consider “the amount of cases that don’t come to court” which are more serious. Mr Tricks also told the court Coles suffers with ADHD and described “countless incidents in the past where he has done things suggested to him by friends and family”. He said Coles has twice broken his neck because he struggles with “decision making”. Mr Tricks said: “There was an incident a couple of days ago where someone suggested he rode a fitness ball down the stairs. Addressing the video, he told the court: “There are people egging him on and he does it with not thought whatsoever. It’s idiotic. “Typical of those suffering with ADHD, there is no thought of consequence. died due to acidic juices in his digestive tract. While it may have seemed funny at the time, it is not a nice end for any animal. “The RSPCA is opposed to the giving of live animals as prizes and would say to people who sees this, don’t be tempted. “Animal ownership is a big responsibility that needs to be planned and well thought out – not a spur of the moment thing that happens just because someone has won a prize. Games offering animals as prizes don’t take this into consideration. Very often the ‘prize’ animals suffer miserably, as the busy fairground, show or even country fete is just too much for them. “Goldfish are often offered as prizes, but are easily stressed. They may suffer from shock, oxygen starvation or even die from changes in water temperature. Many fairground fish die before their new owners can get them home – or soon afterwards.